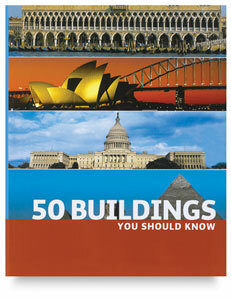 This handsome volume presents 50 buildings in chronological order, representing the most compelling, intriguing, and awe-inspiring structures in the world. Among the masterpieces detailed are the Pyramids of Cheops, the Parthenon, the Colosseum, Cambodia's Temple Complex at Angkor Wat, the Hagia Sophia in Turkey, the Potala Palace in Lhasa, the Jewish Museum in Berlin, and others. Each entry in 50 Buildings You Should Know features full-color photographs of the structure along with informative text that includes basic information about each building's artistic relevance, style, and contextual history. Timelines and sidebars offer additional notes about architectural periods and techniques. This world tour of great buildings offers a mini-course in architecture for readers of all ages. Paperback. 176 pages. 7¾" × 9½" (20 cm × 24 cm).